Anstruther Lake is a beautiful lake in the township of North Kawartha which is a motorboat friendly Lake. 6 kilometers long and 3 kilometers wide, the lake is 1584 acres in size and has a depth of 124 in the deepest part and an average depth of about 40 feet. There are roughly 230 cottages on this lake and it has one marina. The Anstruther Lake Cottagers Association holds a regatta on the civic holiday and a corn roast on Labour Day. This lake is known for its clean clear water and diving cliffs to the east of the lake. Given its shape, there can be strong wind and large waves in parts of the lake so be cautious. Water flows into Anstruther Lake through Camp Creek and out th rough Anstruther Creek. There are a few campsites available through Ontario Parks but need to be booked ahead. There is no ice fishing allowed on this lake as it is a sanctuary in the winter. Located about 9 kilometers from Hwy 28 and minutes to Apsley. If you are a snowmobile enthusiast you can access the snowmobile trail just behind the marina. 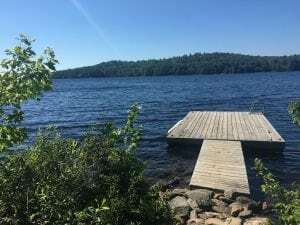 There are several water access cottages on Anstruther Lake and is located in Kawartha Highlands Provincial Park which is second in size to Algonquin. The lake is known for Small Mouth and Large Mouth Bass as well as Lake Trout. 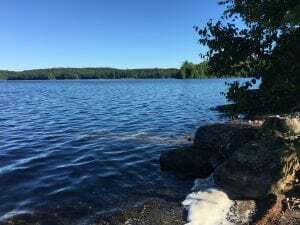 At the north end of Anstruther lake is a portage into Rathbun Lake and several other lakes from there which have access to over 100 campsites if you are up for a challenge, paddle, and a hike. This lake is clean, clear and absolutely breathtaking. 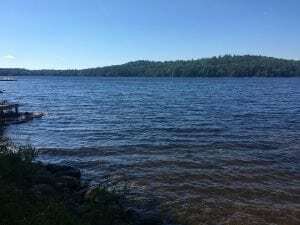 Like so many other lakes in our area, the granite shoreline on many parts of the lake has been a source for many local artists and photographers as well as photographers and artists from all over the world. If you are a nature lover and enjoying seeing some of the old true cottages in the Kawarthas then these lakes will not disappoint you.